The region known to the British (and many French) as Normandy is, today, two separate administrative regions: Basse-Normandie and Haute-Normandie. (Meaning lower Normandy and upper Normandy). 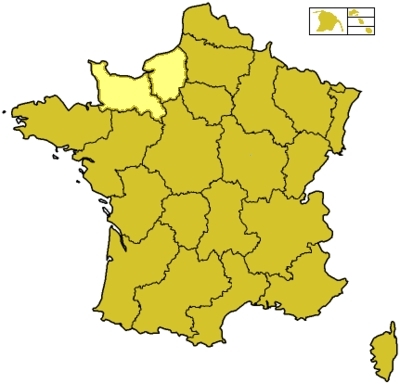 The departments in Basse-Normandie are: Calvados (14), Manche (50) and Orne (61). The departments of Haute-Normandie are: Seine-Maritime (76) and Eure (27).